One Japanese student asked me how to say "thief" in Cebuano/Visayan. I instantly thought this topic deserves to be discussed. There are many types of thieves. If you are talking about a pickpocket, we use the word 'mangunguot.' You have to be careful when you go to crowded places because there are many 'mangunguot' in such areas. Your garden variety thief is called 'kawatan.' 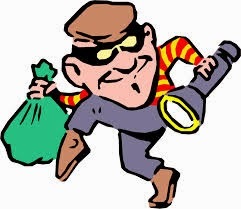 They steal objects or other persons' belongings when no one is around. Conmen are called 'mangingilad.' In English, they are swindlers. And the act of swindling can be done in many different ways. A robber is called "tulisan." Some establishments that they rob are banks, jewelry shops, stores and the like. Listen to this recording if you want to know how these words are spoken.